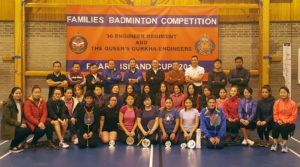 On Friday 17th December 2016 families and children of the Queen’s Gurkha Engineers (QGE) gathered in the Unit Gymnasium for their annual sporting event ‘Pearl Island’ 2016 (Badminton Competition). Despite Christmas leave, attendance was higher than in previous years. Lance Corporal Amber Mangmu put in a tremendous effort to run the event successfully. He took the charge on the day and all families and children thoroughly enjoyed the event. Refreshments were also provided for everyone. The name ‘Pearl Island’ itself originates from a married quarters area in Hong Kong which was once home for QGE families. It was initiated by Major (Retd) Dhan Bahadur Chand QGE in 2007 and from that point onwards his wife Mrs Sunita Chand presents the Pearl Island Cup to the best player every year. The competition was divided into three different categories: singles, doubles and U16s. There was a total of 11 singles, 8 doubles and 4 U16s matches and were played on knock out basis. Many of the families showed impressive badminton skills. Both singles and doubles finals were played very well providing a tense and enjoyable watch for all. Mrs Narbad Bhandari (W/O GM QGE) and Mrs Sunita Chand did the honour of presenting trophies to the winners and runners up. 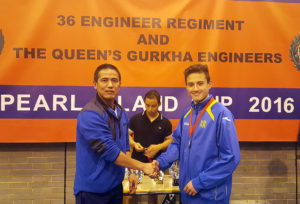 In the U16s category Master Suveen Gurung was victorious and Master Bishes Bhandari was runner up. 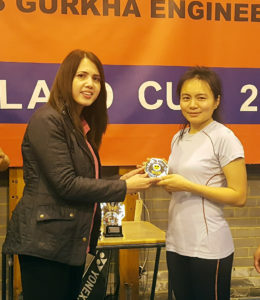 For the Ladies singles Miss Rujeena Thapa managed to clinch the Pearl Island trophy and Mrs Aliza Limbu became runner up. Mrs Rebecca Limbu and Mrs Tabita Rai won doubles competition and Mrs Sujata Limbu and Miss Rujeena took second place. 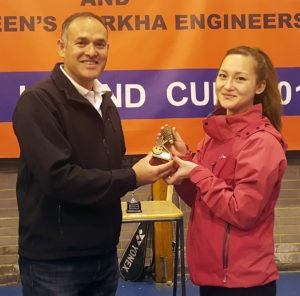 Mrs Hema Rai also received a prize for best improved player. At the end Dhan Chand Saheb highlighted some families sporting events during the Hong Kong era followed by GM QGE Major Buddhi Bahadur Bhandari MVO who emphasized the importance of sport amongst the families and children. He thanked all the organising members and participants for a great day.